One of the newest and most impressive additions to Sony’s line of projectors in the new 4K Ultra Short Throw Projector, which is able to turn any wall in your office or home into an incredible 4K display. 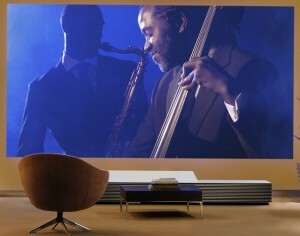 This projector is part of Sony’s new Life Space UX line. One of the most convenient features it has, which also separates it from the rest of the projectors on the market, is that it is made to be placed directly next to the wall that it will be projecting onto. That way, it won’t take up any awkward space in the middle of the room and will come off as more of a decoration piece, or maybe an air filter… or something. The projector uses a laser light source to project a screen size of up to 147 inches. The actual unit will measure 43.3″ x 10.4″ x 21.1″. It comes equipped with 4 HDMI ports so that you can connect just about anything you could even think of. It’s a little bit on the big side, but it has a lot of nice features, and with it being such a short throw projector, it doesn’t really matter that much what it looks like. It also eliminates the need for any other type of display in the room, resulting in a more modern, organized and professional look overall. The new, super futuristic, super short throw projector is going to be released this summer. The cost of owning one is going to be through the roof, a whopping $40,000. Having a projector for your business makes life a lot easier for everyone when you are conducting meetings or having a video conference. The biggest problem most people have is being able to choose the correct projector to fit their personal business needs. This can take a lot of time and research. While you are looking for the projector that fits your business perfectly, consider the following. One of the most important things to look at is brightness. There are different projectors with different brightness levels for use with lights off, or light on. Depending on how bright the room is, selecting the correct brightness level is going to insure that you get the highest quality picture. If you are going to be using the projector in a well lit room, then you will require a projector with a high lumen count. anything between 2000 and 300 should get the job done. There are also many projectors that you can control the brightness level on, so you may also want to consider one of those models so you can be prepared for any situation. No matter what you end up using the projector for, you always want the best resolution possible. If you are in need of bright colors and a clear picture, then you will probably want to shoot for something at least in the 720p range. 1080p and 4K models are available as well, depending on your budget. 4K is the latest high-definition technology, and will give you an amazing picture all the time, no matter what with an incredible 4096 x 2160 resolution. This is also another factor that you will have to consider when thinking about picture clarity. Contrast ratio is referring to how deep the black colors are, and how bright the white’s are. For a more crisp and defined picture, you will want to make sure that the projector you choose has a high contrast ratio. If you are looking for a quality projector for your business, you are going to want to invest your money into something that is going to last a long time. Generally, the projectors on today’s market that will last the longest are using LED projector lamps. Most of these are rated for tens of thousands of hours, while other projectors with normal lamps are rated for around 2,000 hours only. Getting a projector with an LED lamp is obviously the better long term option here. When talking about “throw”, this is talking about how far away from the screen the projector has to be in order to project a nice, clean image. Depending on the room that you’ll be using your projector in, there are plenty of options. Just make sure to take this into consideration. If you’re not sure, then don’t be afraid to ask. There are many options for projectors out there, and choosing one isn’t going to be easy. But if you check in to everything I just told you, your life could be a little bit easier.